There’s no need to mention the February heat. It is still as hot as ever. Who wants to live in this heat? It always makes you sweat. The traffic jams only make it worse. Whenever you think about getting away from the downtown bustle, it is always this frustration comes to mind. What a thing! Everything is stuck, nothing moves. 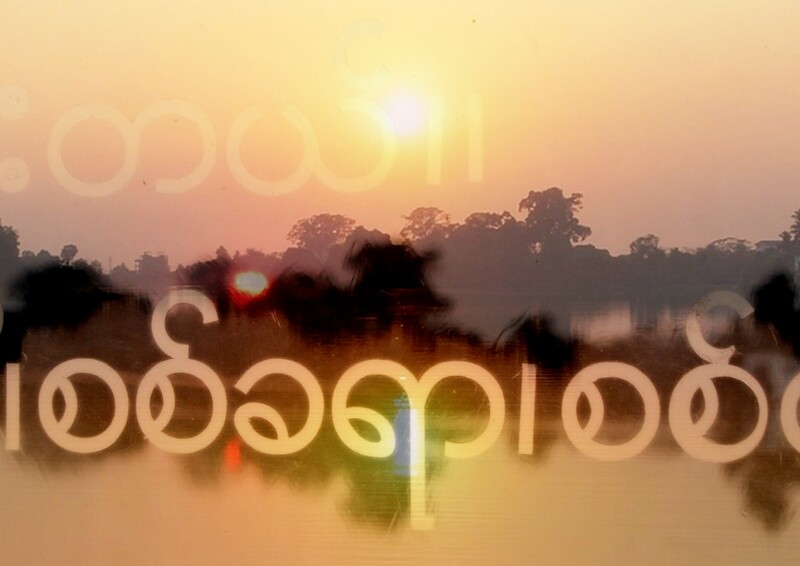 I am heading for the Inya Lake hotel where for the first time a literary festival called ‘The Irrawaddy Literary Festival’ is being held. Both international and local writers are going to be participating. I think it will be marvelous to take part in this festival. 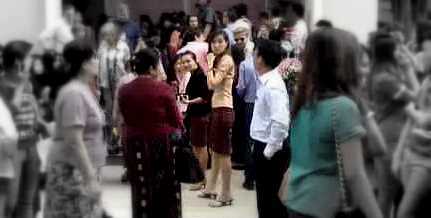 At the entrance of the hotel, I look for my senior writer, Sayar Lay Ko Tin who has invited me to come to this occasion. I see several people gathered round, buying books from assorted book stalls but I don’t see him. I turn around and see Sayar Lay Ko Tin walking towards me. We shake hands and he gives me an identity card to wear. I look at it and smile to see my name on it, as we both make our way into the lobby. There are several tables set out on the terrace. We choose one of them and sit down to discuss the topic we have to present at the panel discussion. Our session is at 11:30 after the poetry session. My senior writer suggests we go and listen to the first session which is sure to be interesting. He says that we will leave half-way through and then walk up to Ruby Room A where we will present our topic after the poetry session has finished. Looking up, I am really surprised to see who it is. It is Vikram Seth. I feel really thrilled because he is the one writer I really hoped to meet at this festival. What a chance! He seems to like my answer and smiles at me when I speak to him. I tell him I know him because I have read and admire his books. Another surprise is that the famous writer, Jung Chang is with him. She looks fabulous in her pink blouse. When they see our ID cards, they learn that we are Myanmar writers and we talk about the festival and literature until we hear the announcer’s voice coming from the Sunset terrace where the opening ceremony is about to be held. There, the British Ambassador makes a speech, remarking upon the significance of this festival, followed by a speech by U Pe Myint. All the audience applauds their well-chosen words. We enter the ball room where the poetry panel discussion is being held. It is spacious and there are many people sitting there, listening to the four members of the discussion panel – the editor, James Byrne, the translator Ko Ko Thett, the moderator Zeyar Lynn and a female Filipino poet. 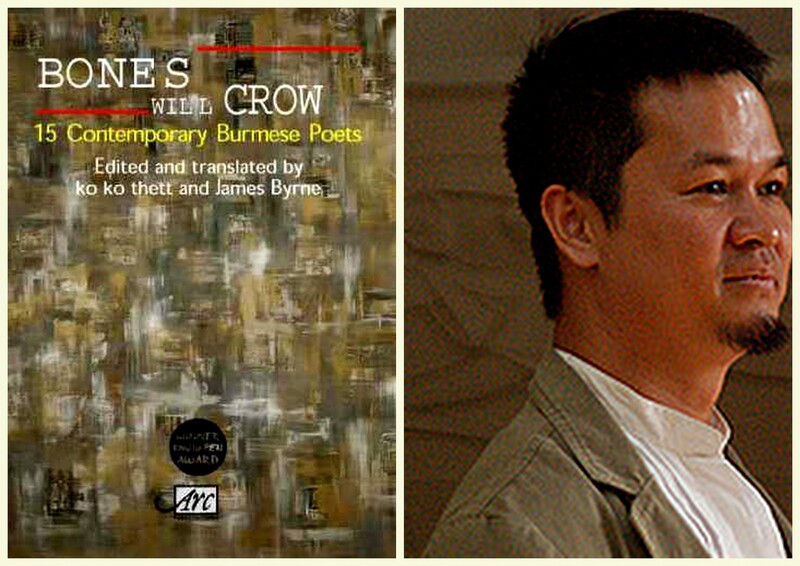 They talk about the nature of the poems in ‘Bones Will Crow‘, a collection of Myanmar poetry which Arc Publications has recently published. It is very interesting and I would like to stay longer but my senior writer is now pointing at his watch. It is time to leave and we walk upstairs to Ruby Room A. At first, there are only a few people there, but, by the time we are ready to start, nearly every seat is taken. The topic of our discussion is “Translation and Adaptation,” and after my senior writer has introduced us both, Ko Thet Oo begins the discussion. I feel it goes very well and many interesting points are made. In the evening, I sit out on the terrace and reflect upon the day. 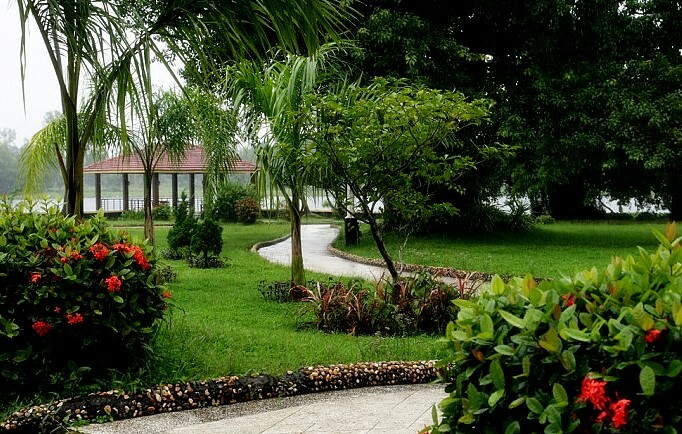 The atmosphere here is peaceful yet stimulating. Away from the daily pressures of the busy city, creativity seems to flow unimpeded. Yes, everything appears more vivid to me. The lake in the background. The sunlight dancing on its green ripples. The walkways fringed with palm trees. The small wooden bridge that protrudes into the lake. The men and women standing and sitting on its boards, drawing and writing. I feel sure that this experience will linger in my mental mouth, far longer than these three days. I am thinking about whether I should buy the novel, ‘Two Lives’ by Vikram Seth. I am confused because I only have a limited amount of cash but would dearly like to read the book and for him to sign it for me. Putting it back down, I decide, for now, to make do with the photograph I took yesterday of Sayar Lay Ko Thin, Vikram Seth, Jung Chang and me together. I will buy the book later. Unfortunately, I cannot. For when I do return, the last copy has been sold. At the festival, there are many foreigners. They outnumber the local people, but I think it is good that they are here. Out on the terraces, some are seated in front of a Myanmar puppet show, some are listening to Myanmar classical music being played by a young local woman upon a Myanmar harp, and some are sitting on the lawns, talking and playing with their friends and children. The mood is relaxed and carefree and the air is an inclusive one. The festival appears to be not only affecting me. Sitting in the shade and drinking a glass of sweet iced tea, my mind goes back to the panel discussion with Jung Chang this afternoon. In the audience there were both young and old people. But the person I recall most clearly, is the female Japanese photographer who was trying to get the best shot she could of the lively discussion. Although I watched her keenly, she paid no mind to my attention. Rather than her looks, it was this modest manner which made such a strong impression on me. It is nearly the last session of the last day of the festival and I have to attend it. It is the panel discussion with Vikram Seth and I want to ask him a real question. At 4.30 PM, the discussion starts and I listen carefully, making sure to take notes. The moderator is discussing with him the nature of his fiction. His answers are illuminating. When I met him, he asked me how I had first discovered his work. I told him that the first thing I read were some of his poems on poemhunter.com. I liked them very much, so decided to read his novels. During our conversation, Jung Chang also told me that she’d heard that her book “The Wild Swans” has been translated into the Myanmar language. I told her that indeed it had, but, sadly, the translator had now passed away. After the discussion, Mr Seth takes questions from the audience. There are many people who want to, so, I have to wait my turn before I ask him mine. “Live and write,” is his reply. I thank him for his answer; it is inspiring enough. The festival now comes to a close, as it began, on the Sunset terrace. To an orange backdrop of the setting sun, the writers, organisers and the people in attendance listen to the closing speeches then bid farewell to one another before the curtain comes down on the festival and the darkness falls. Leaving the hotel alone, I hear a quartet playing jazz in the lobby bar. Like my mood, the melody is lively and happy. Strolling slowly down the driveway, which winds its way to the gate of the hotel, I reflect upon my own experiences over the last three days. I smile and nod to myself. Maybe the future will come about as I wish, or maybe not. No one can be sure. For the time being, what matters is to stay focused and determined. Yes, I feel I have become more mature. 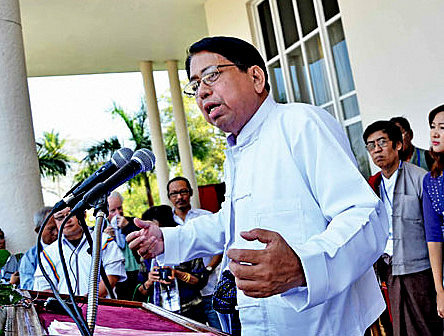 San Lin Tun is a Myanmar-Mon national and lives in Yangon, Myanmar. As well as having his story, ‘An Overheated Heart’ appear in Hidden Words, Hidden Words: Contemporary Short Stories from Myanmar, his own work has also appeared in the New Asian Writing Short Story Anthology, 2011 and his translations have appeared in the Asia Literary Review. His poem ‘Red Dragon‘, won the inaugural Welsh Day poetry competition in 2015, chaired by the former Director of Poetry, Ireland and he has completed and published the first English translations of Shwe U Daung’s Burmese Sherlock Holmes, as well as having 10 English language fiction and non-fiction books published in Yangon, Myanmar.